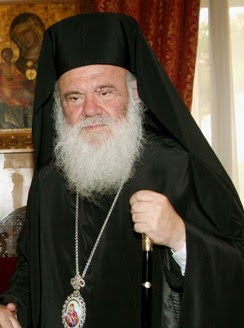 Archbishop Ieronymos yesterday issued a strict message to priests who failed to submit reports regarding Church collections by a June deadline. According to sources, the archbishop also warned any clerics who have been accepting illicit payments that such practices would not be tolerated any longer. "All that is over. From now on, I will not tolerate any suspicion of mismanagement of funds," Ieronymos said. According to the same sources, the archbishop sought the resignation of about 50 priests currently responsible for church collections because the churchmen in question had failed to submit their financial reports in time. "It is not proper to ask the faithful for money to perform the Mysteries; to cheat tips out of people is a shame. If the faithful want to give money, let them give." "Do not politicize in public, but hold your political opinions to yourself." The Church of Greece’s finances are in rude health, according to a report handed to Archbishop Ieronymos this week, which indicated that the church made more than 7 million euros profit in 2008. According to the internal report, almost 20 million euros of revenue flowed into the church’s coffers last year, mostly from the renting out of church property. It also earned some 4.5 million euros from investments. During 2008, the church spent almost 12.5 million euros. The biggest outlay, just over 4 million euros, was for sponsoring events. Almost 4 million was spent on salaries. Last year, the robust state of the church’s finances also allowed it to buy 1.6 million shares in the National Bank, taking its stake in the lender up to 7.7 million shares. Thessaloniki court decided yesterday that a priest and three members of an ecclesiastical council should stand trial on charges that they tricked a cancer sufferer into making the Orthodox Church a gift of a half a million euros shortly before his death. The court heard that in the days preceding the 82-year-old’s death, his health had deteriorated and, as a result of the heavy medication he was receiving, often did not recognize people nor was he able to speak coherently. Nine days before he died, the man allegedly appeared at his local bank with the priest and three church officials to withdraw the money. Bank employees told the court that the 82-year-old appeared confused and had to be reminded he was withdrawing 500,000 euros, not drachmas. The man’s widow launched the action against the four men, who, along with a fifth person, will stand trial for fraud. An investigation into the finances of the Church of Greece’s nongovernmental organization Solidarity has revealed that 13 million euros are missing, sources revealed yesterday. The development came one day after a senior cleric at the Bishopric of Attica sent Archbishop Ieronymos his resignation in protest at a decision by the Holy Synod not to make the jailed former bishop of Attica, Panteleimon, face a Church court.